My Favorite Apps: Top Two for Notes. There are thousands of apps out there that will allow the iPad to be used in many, many ways. I have to say that in my house, unless I'm going to be formatting a research paper or something of that nature, it is the device I pick up the most. At work, it is my go-to device for when I'm traveling from school to school and want something quick and light-weight to carry around to take notes, check emails, do web browsing, and more. As I mentioned before, right now in my district administrators can purchase iPads for their use and we are now accepting applications for a student pilot of iPads in the classroom. Since administrators are the ones who have iPads in hand right now, I'm still keeping my focus on apps for them and teachers. Don't judge me for the US Weekly and Disney feeds! So today, I'd like to share my favorite apps for taking in content. By content, I mean the apps I use to keep up with the blogs I read, news, current trends, and a little social media. My first love for this is Flipboard. The first great thing about Flipboard? It's free. So what does it do? Well according to the makers of the app, it's a social magazine. Great, but what does that mean? Basically, you tell it what content you are interested in, and it pulls that specific content into a visually appealing magazine like format. All in one place. So no more going to twitter to read tweets, google reader to reed feeds, specific news sites to read the news. Everything is all there in one place. For those of you who are thinking, well I do that already with RSS feeds in a reader, well I did too! The reason I like Flipboard so much for this is because it displays the content in a more visual format, kind of like a magazine. You can see in the screenshot of a page of my Flipboard screen, I have a mixture of blogs, bundled folders from my Google Reader, magazines, and twitter hashtag searches all feeding into Flipboard. And I can turn the pages by swiping my finger. Also, I can easily share anything I find interesting by tweeting or Facebook-ing it, or I can send links via email. Pretty cool right? I think so too. A second app that I really like is Zite. Instead of pulling your specific feeds into the app, you pick out sections from categories such as Technology, Education, Social Media, Pets, and more. You can also enter your own keywords to create sections. You can also connect to your accounts such as Google Reader, Facebook, and more. Zite pulls in stories, and you can "like" them, kind of like you like songs on Pandora or rate movies on Netflix. The app uses your preferences to send you more stories. It's a great way to get information and see articles you know you'll be interested in. And of course you can also share what you're reading with the click of a button finger. Be careful...this app by default does make a whistle noise when it shares...it drives my dogs crazy every time! And finally, even though I do love Flipboard for getting my read fixes in a visual way, I can't not give props (is that still a saying?) to the Hootsuite App. I first started using this one more than Tweetdeck at the urging of Jason Mammano over at Have Technology Will Travel, all because he loved the little owl that pops up when you send a tweet. Seriously though, I think it is great for many reasons. You can add multiple Twitter and Facebook accounts, add hashtag searches to your streams, see all your direct messages, mentions, retweets, and more. You can also view analytics from this app, and follow people straight from the app. The other clincher for me is that if I'm not using my iPad, I can log-in from the web and everything is all synched together. For some reason there were times when my Tweetdeck columns weren't synched between devices, which gave Hootsuite the advantage for me. Also great was the one time last summer when I tweeted a question to @hootsuite about an issue I was having, they replied back in less than 5 minutes. The free Hootsuite app and site both have a few ads, but I barely notice them. So those are the apps I use to keep up with content- what are your favorites? I spent a little time tonight looking back at the classroom blog that I started back during my first full year as a teacher, before I was even accepted in the Pinnacle Technology Leader program that we have in my county. In fact, I had forgotten that I even HAD a blog way back then, but the proof is there! What's interesting to me is comparing the blog I had then to the blog that I had the next year. One reason I love having a personal blog is because it's like a diary of sorts that reminds of those sometimes mundane turned awesome life happenings when memory fails. 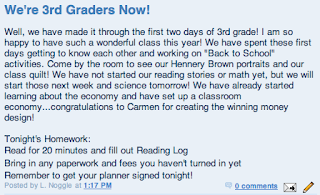 As is turns out, my classroom and professional blogs work the same way. 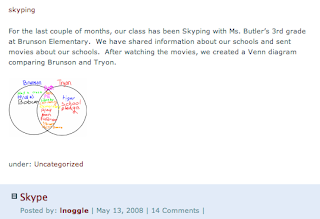 In looking back at my first classroom blog, it was totally there to distribute information. It wasn't to provide collaboration or spur discussion, but simply used as a tool to get information out to parents and students. 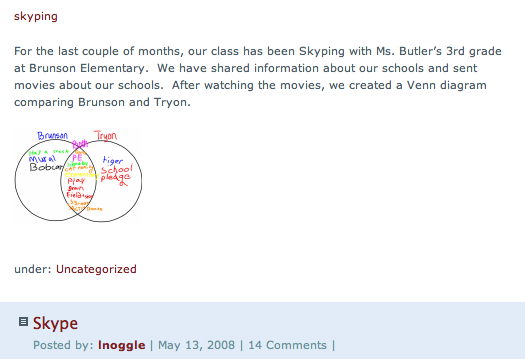 But...just like my blog evolved in my 2nd year, so did my other use of technology. I started focusing on letting my students use whatever technology was available, not just me. And it wasn't just about using the technology... I figured out that what was most important was what students were DOING with technology. So using the technology wasn't important, but learning was. And learning new technologies wasn't even important, but learning about the moon, or other countries, or about the life cycles of plants, or about how to work together even with people you aren't best friends with was the important stuff. 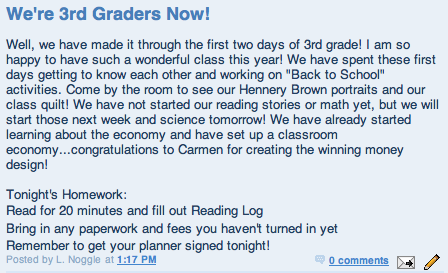 And if through doing that, students learned new technology or got to use the newest "it" site great. And you know what? Teaching with technology, and integrating it in a way that was seamless and flowed wasn't always easy. BUT. It was possible. I know it was, because I did it. But that doesn't mean that it is going to happen overnight. So my advice to all those trying to figure out ways to teach with all this new technology? Whether you're a veteran teacher trying to update your teaching practices or a novice teacher already in love with all things tech...take it step by step. Baby steps are okay. The same methods don't work for everyone, and that's okay. If this year or this semester, you want to try using a class blog or give a site like Edmodo a try and just focus on communication, that's okay. Don't feel like you have to do everything at once, and don't feel like you have to try every single new thing out there. Because you know what? Technology and all the cool new stuff shouldn't really the focus. Your content should be. All that cool stuff may be a great way to engage your students in your content...but that's what your Instructional Technology Facilitator can help you with too! So if you're scared, it's okay! Take small steps, and don't be afraid to ask for help! What's your advice for integrating technology into teaching?